What awesome places has your GPS taken you? Key West last winter. It was fun viewing the trip log across US 1 from Florida City to Key West. But you don't really need the GPS ... only one way to get there and one way out by car. 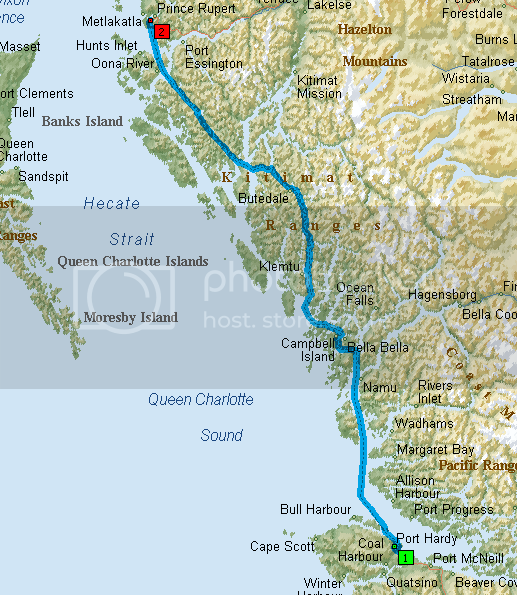 A couple of years ago, took the 15 hour ferry ride from Port Hardy, BC, on the Vancouver Island, to Prince Rupert, BC through the inland passage. Spectacular trip, especially with the Nuvi keeping track of where we were. Wow Rick! That does look awesome!. I wanna do that someday ... putting it on my bucket list. We carried on from Prince Rupert to Prince George which is in the BC interior, and down through the Okanagan valley with it's miles of fruit trees and wineries. All in all a great trip. Here is another really cool trip that my wife and I took back in 2008. It included a visit with our families in Ontario Canada, taking my wife to Washington DC which she had never seen before, a visit to NYC which I had never been to before and a stop in the 6 US states that completed our bucket list item to visit all 50 states and 10 Canadian provinces. A Garmin Nuvi 760 and TomTom 930T were with us all the way as we did a comparison article for another GPS forum. ;) Total miles - 8700 or 14000 KM. Have been thinking about this for awhile, and my story is practically in my backyard. Sorry, the ocean isn't involved. :) There's a park nearby that includes the ruins of a 100 year old industrial complex. Some ruins are visible from the park trails, but I knew there were more buried deep in the dense thicket that is very difficult to penetrate. Using the architect's original plans and aerial imagery from 2008, 1950 and 1935, I created a .kmz "custom map" of the site using GlobalMapper. Loaded it on my Montana and ventured into the thicket. I was bloody from the holly and greenbriar, but it was worth the effort. Very few people have been here, it was like going back in time. That's awesome, @Boyd. I'm a sucker for historical maps. I'm a sucker for historical maps. Always amazes me how coincidental entirely separate people wind up in or near the same place. I just finished a two week trip by sailboat from Maine to Nova Scotia. A little over 36 hours from Boothbay ME to Shelburn NS over open water. Then on to Moutoon Harbor, Lunenburg, Mahone Bay, Brooklyn and other stops. Surprisingly one of the most enjoyable places my GPS and boat have taken me. @privet01: You don't happen to be Russian do you? I am (but I was born in East Los Angeles)...I know that "privet" means "greetings" in Russian. I also believe that Boyd is Russian as well. No, it's just one of the few words I can remember that was taught to me by a Russian girl a very long time ago. I'm from Chicago originally. The worst was when I was up on the Olympic Peninsula in Washington and took what looked like an easy shortcut to a nice spot by the water on my GPS, and it led me through a little woods trail, and when I emerged I emerged by an active shooting range with the shooters looking at me. I didn't want to look lost so I kept going figuring the best tactic is always to look straight ahead and move fast and act like you belong wherever you are. Then I found myself in some sort of compound with military but not uniformed looking people all over. I was trying to find a way to get out when I was flagged over and questioned about how I got in by hostile people. I finally was able to leave, through a secured checkpoint. I never knew what that place was, but I was lucky to get out of there alive. This is an interesting thread and I think it should be resurrected. That misadventure I described above was not good and could easily have been much worse, but my GPS has also found many excellent places for me that I would otherwise have never seen. I still have the exact location of that scary place in case anyone might know what it is that I escaped from as I'm still pretty curious even tho it was over ten years ago. I've been looking at that place on Google Earth. I think it may be deliberately obscured. Also my new Garmin maps no longer show that "shortcut to the water". I love Key West. Lived there for two years back in the 90's.